I’ve been reading Living magazine for years. Before I started subscribing, I was watching Martha’s tv show. The first apple pie I ever made was from her recipe. The first time I ever made chicken stock, I followed her instructions. Yes, I’ve been a long-time fan, but for some reason, I had never before made a 'What’s for Dinner' meal in its entirety. Do you know that article that appears every month? It’s always at the back of the magazine, and I usually have to flip there first just to see what’s for dinner this month. There are always four recipe cards that are perforated, and three cards make up the main part of the meal, and one card is dessert. The look of those removable, perforated recipe cards has been repeated many times by advertisers, but in 'What’s for Dinner,' the two pages on either side of the cards show more photos of the meal and a prep schedule. I almost always remove the cards and store them in a file unless it’s a rare meal that doesn’t interest me. So, I have dozens of these meal plans and have tried single recipes from them here and there, but not until last weekend had I actually prepared one of these complete meals. The meal I prepared is from the October issue, and as soon as I saw it, I knew I'd be making all four items. Three of those are shown here today, and I’ll post dessert soon. The first dish was roasted pumpkin soup, and I found the cutest, little, bright orange pumpkin at the farmers’ market. Unfortunately, it wasn’t as bright in color on the inside, but it was still delicious. Pumpkin slices were roasted with onion wedges, a clove of garlic, and two shitake mushroom caps. Once roasted and cooled, the skin was removed from the pumpkin, and everything was pureed with some stock. The puree was then brought to a simmer as more stock was whisked into the mixture, and then it was kept warm while cheese flautas were prepared. For the flautas, a cilantro pesto was made from sauteed garlic and pepitas, cilantro, lime juice, and olive oil. The pesto was spread on corn tortillas and was topped with shredded monterey jack cheese. The tortillas were rolled up and then fried until golden. Earlier in the day, I made a roasted salsa verde to serve with the flautas. 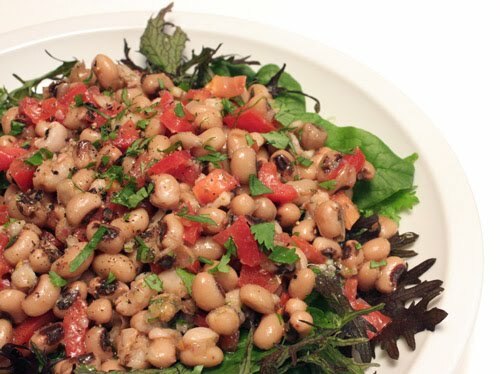 The third item on the menu was the black-eyed pea salad with baby greens. Black-eyed peas were tossed with a vinaigrette made from tomato, onion, garlic, cilantro, red-wine vinegar, dijon mustard, and olive oil. The peas were then spooned over a platter lined with spinach and baby greens. The pumpkin soup was not a sweet kind of soup at all, and too much sweetness is my usual complaint about pumpkin or squash soups. The onion, garlic, and those two mushrooms gave it good, savory flavor. The black-eyed pea salad was varied in taste and texture, and the peppery baby mustard greens matched nicely with the peas and vinaigrette. 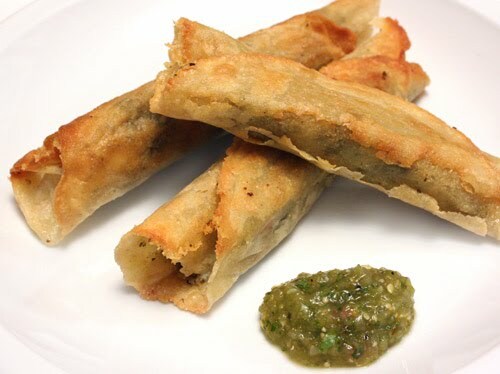 And, those cheese flautas with cilantro pesto? Those crispy, cheesy, rolled tortillas were, of course, a hit. Pulling the whole meal together was simple because the soup and salad could both be left aside without worry as the flautas were prepared. It was a well-planned meal, and every part of it was suited to the season. Good point about too much sweetness in a soup. It shouldn't taste like liquid pie. :) It is nice to taste the sweet and savory sides though. Those flautas is calling my name. Yum!!! The pumpkin soup looks fabulous. That would go really well right now. The weather's perfect for it. those flautas look amazing. if we aren't trying to loose weight, i would be making them right now. I just found your blog and I'm so excited I did! Your recipes look SCRUMPTIOUS! I LOVE flautas, but I gave up fried foods for 2009 :( so in January 1st I will be making your cheese flautas! :) I'll be checking back often! I love the idea of 'what's for Dinner'. This is such a great meal. Everything looks so yummy. Wow, I pause in amazement - in one fell swoop you managed to touch on a lot of my favorites. They all look absolutely amazing. Thank goodness, I just ate dinner or I'd surely be suffering now. Yum, what a great meal! 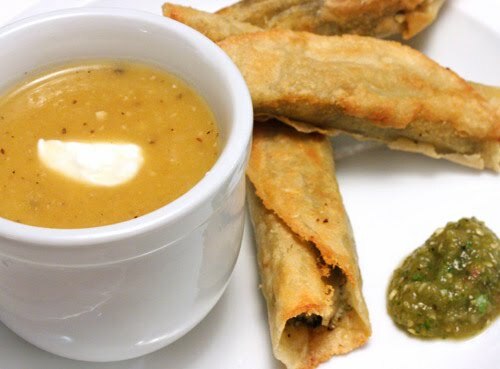 The flautas look fantastic and perfect with the pumpkin soup! mmmm. i love creamy fall soups. this sounds delicious! Oh, yummy! Everything looks particuéarly flavorful! This is such a great complete meal! It's so hard to choose a favorite (of course, I don't have to) but I can't resist the flautas - the crunchy promise is too much. But the black-eyed peas salad is a very close second. Thanks for including the recipe links! ohmigosh!! The perfect meal EVER! Look at that crispy, thin skin of the flautas! And the richness of that soup! WOW! Those flautas look like a Real Food version of taquitos! Must make! In general, that is just a gorgeous, colorful, I'm sure delicious meal! I really don't like my squash soups sweet either. Yours sounds just right and I love flautas! 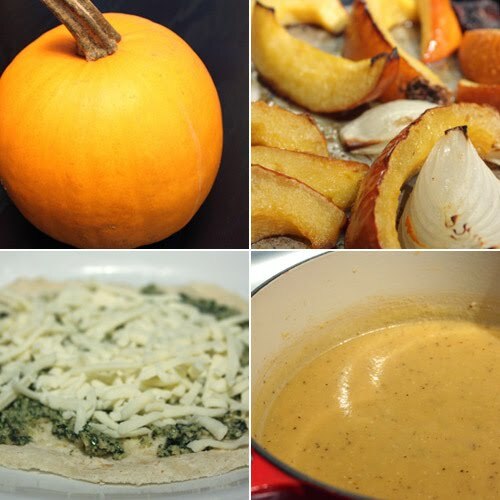 Wow, what a delicious soup,i love pumpkin I bookmarked this to try. Oh my goodness, how gorgeous! Pass some over here daaaaaahling! What a delicious trio! I think I like the flautas best, the soup is a close second, and the salad looks great too! I love any kind of a squash soup, and this one looks perfect. But those flautas? Oh yes - sign me up! This is the combo special of the season. I've seen that What's For Dinner series...but have never made anything. After reading your post, I better rethink that. Popped in to say hi! I love the soup and flauta combo! What an intersting meal!! I so love your yummie soup with the cilantro pesto on the side with these cheese flautas!! I've just subscribed to Living and I'm waiting for my first issue - the meal cards are such a cute idea! I love the idea of mushrooms in pumpkin soup to give it some earthiness - everything sounds delicious! What a fantastic autumn meal. We do quesadillas quite often with soup -- but flautas are a great idea! Gotta remember that for next time. This is a lovely dinner. And the cheese flautas look delicious, I've never tried nor made (actually had never heard of them), but you've inspired me, as so many times before. What a meal! Liked it that you roasted the onions with the pumpkins and the idea using mushrooms. Very unusual. That salad is lovely!